Something I’ve learned in this life of traveling, ballpark touring, scorekeeping and next-day blog posting: it’s hard work. Harder than I anticipated. Especially when trying to balance it with full time youth ministry and seminary work. So forgive me for the delay on this post. I’ve been itching to get to it because AT&T Park was such a terrific host. I spent last weekend in Los Angeles, Seattle and Oakland. San Francisco was my last stop on the West Coast Tour, and it did not disappoint. Five hours before game time, I was on the field. My publisher, The House Studio, arranged for me to meet up with Jeremy Affeldt, Giants relief pitcher and all around stud, at the ballpark that afternoon. Jeremy is a two-time World Series champ in 2010 and 2012, and was Setup Man of the Year in 2009. He also wrote a book called “To Stir a Movement: Life, Justice and Major League Baseball” last year. Told you. Stud. We talked about his journey as a Christian in the MLB – struggles, failures, calling, morality, mission – and it was so awesome to hear him share his experience of God as a professional ballplayer. I’ll mention part of our convo in this post, but you can read the whole interview with him here. While I was hanging with Jeremy in the seats behind the Giants dugout, I couldn’t help but glance around as other players arrived at the ballpark. Tim Lincecum, the Giants starter Monday night, came walking in sporting a yellow and purple Washington Huskies cap, which paired up nicely with his gorgeous mustache. Buster Posey had the night off, so he was out on the outfield grass playing with his little son. Sergio Romo rode in on a custom scooter. I was borderline freaking out, but I tried to keep calm in front of Jeremy. It was just another day at the office for these guys. Yeah, killer office, man. 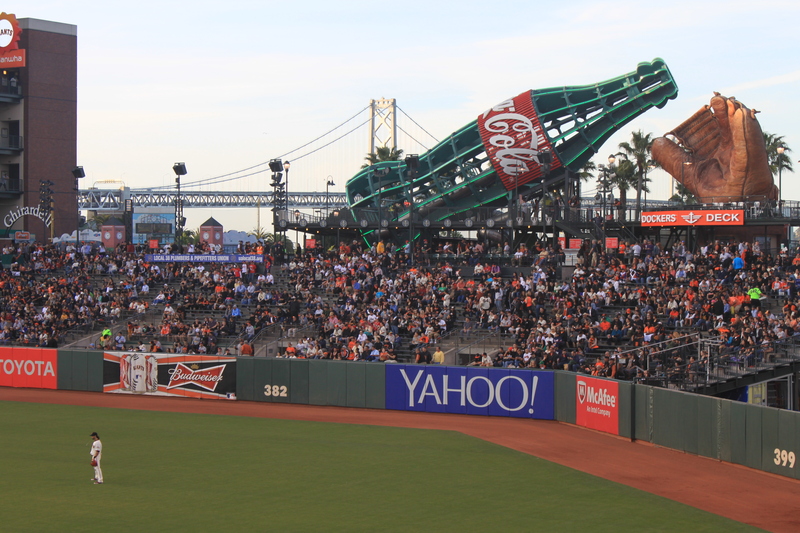 Affeldt told me the view from the seats we were sitting in was the most Instagrammed photo of 2013: the Coke bottle and glove beyond the left field wall. I told him that photo has been my Facebook banner photo for the past two years. I was trying to brag because I put it up in 2011 before it was cool. I think I ended up just sounding lame. It is beautiful though. AT&T Park is situated just south of the Bay Bridge on the west side of the San Francisco Bay on “McCovey Cove” after the former Giants slugger – although, I suspect that it wasn’t called that before the ballpark was built in 2002. The seats in right field are only three rows deep, so occasionally a ball will leave the park entirely and land with a splash in the Cove. There have been 65* splash homers since 2002. Thirty-five were hit by Barry Bonds. Which means there have been 30 splashes over 12+ seasons. Which means, ignoring Bonds, it happens about 2-3 times a year. So it’s relatively rare. Nevertheless, you can always count on a handful of kayakers parked in the Cove hoping for a souvenir. * – As of Monday night. Brandon Crawford hit one two days later to make it 66 splashes. Our seats were in the front row of The Arcade, which is what they call the 3 rows in right field – hoping to see a splash on Monday night. Second inning, two outs, in his first ever MLB at bat as a starter, Tyler Colvin unloaded on a 1-1 pitch. It sailed over our heads – over The Arcade -and splashed in the Cove. Colvin had a game: 2-3 with a triple and a homer. I watched the replay and took a screen shot of the home run. Hard to see, but there’s where I was sitting. What an incredible experience for Colvin. He’s probably been working to get into the big leagues for a long time, and to have a game – a moment, really – like that in his first MLB start? Amazing. Jeremy and I were talking before the game about the pressure rookies feel they first come into the league. They’re still seeking permanent work and the financial security it provides. They want to feel like they’ve made it, and often times they – like Affeldt – don’t experience immediate success when they break into the league at a young age. Now, I don’t know anything about Colvin’s spiritual life, and I’m certainly not claiming this to be true of him at all. I don’t know if he believes in God and feels a calling on his life like Jeremy and I do. But I wonder what happens to a rookie when they experience immediate success. Do they continue to need God? Or do they begin to rely on their own strength instead? Jeremy had a great quote about this that I didn’t include in yesterday’s interview post: “They don’t need God, and they’ll tell you that. ‘I’ve got money, I’ve got cars, I’ve got women, I’ve got fame – why do I need God? '” Because of his early struggles in the game, Jeremy has a profound perspective on failure as an athlete. Success doesn’t cause us to grow. Only failure can do that. I admire Jeremy for his pursuit of God in the midst of his struggles as a professional athlete. It is his frustration, struggle, pain and perplexity that have taught him to find his strength in God and not himself. That’s what was running through my head when Colvin put the Giants on the board in the 2nd. Where do we find our strength – in ourselves, or in the one we created us in his image? Do our actions reflect that understanding? Is it about us, or is it about our Creator? It’s a question not just for athletes, but for all of us to consider. When I finish this book, and it’s selling millions of copies and is a NY Times Best Seller*, who gets the glory for that success? Is it about me, the creator of this book, or is it about the ultimate Creator – the one who made me, gifted me, and has already written my story within his Story? Or when this book flops, and the only people reading it are friends and family who are simply humoring me, reading it out of obligation because of their relationship with me, will I look to God to teach me why I’m not experiencing success for all my hard work? Will I allow the Spirit to grow me, give me strength and persevere in my calling as a follower of Christ? What is it for you? Can you relate? What has been your experience of failure or success? Where does your strength come from? San Francisco is a good place to talk about hills too. It’s been four days since I left the Bay and my calves are still sore from walking around that city. Earlier in the day, I was in a cab headed to Pier 39. My driver and I were chatting about the Giants and their season so far. I told him I was excited to see Tim Lincecum pitch that night, but the driver wasn’t so enthusiastic. It turns out Monday was that day. Because Timmy and his mustache were awesome. He was absolutely dominant. He went 7.2 IP, 2 H, 1 ER, 11 K. His breaking ball is a slider-curve combo (slurve) that he can control all around the strike zone. It was unhittable on Monday night. BJ Upton, by some miracle, had 2 hits – a solo homer and a double – but the rest of the Braves lineup was totally miffed by Timmy the Freak. When I left for the coast, I thought I was going to get to see Aaron Harang pitch for the Braves. 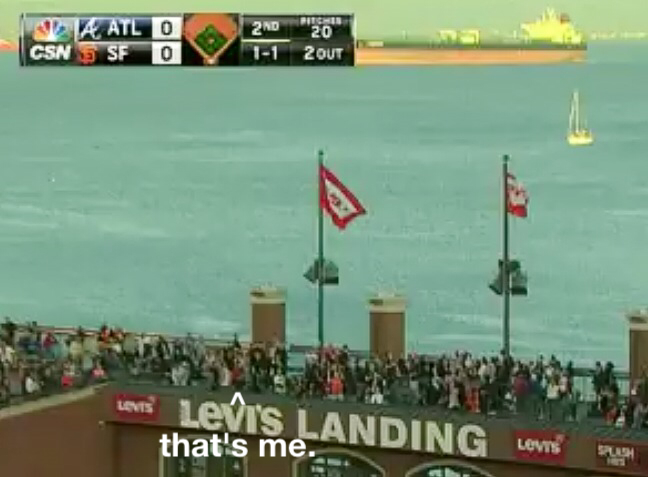 Instead, I saw Gavin Floyd, who did his best Harang impression holding the Giants to 1 run through 6 innings – Colvin’s splash being the only mar to his line. But in the 7th, the Giants put on 4 straight batters. Hector Sanchez led off with a single. Brandon Crawford reached on a grounder to first that Freddie Freeman couldn’t corral. Colvin ripped a triple scoring both base runners, and then he scored himself on a Brandon Hicks single. Floyd got to pitch to Lincecum, whom he struck out, before getting hooked, and the Atlanta bullpen shut down the Giants’ bats from there. But the damage was done. 4-1 Giants headed into the 9th. Giants manager Bruce Bochy had Affeldt warming up for a long time, and closer Sergio Romo was ready too, but he decided to go with Javier Lopez to start the 9th instead to pitch to the lefty Freeman before bringing in Romo to get righties Chris Johnson* and Gerald Laird. * – Also, how many people do you know named Chris Johnson? I know at least 5. Lopez promptly gave up a splash HR to Freeman and left the game after 1 batter with a binary line: 0.0 1 1 1 0 0. But Romo closed it: 4-3, 4-3, and struck out BJ Upton looking to end it. The Bay Area really treated me right. Oakland and San Francisco have been the two best games I’ve seen so far, and they stopped my home team losing streak at 6. The home team is now 5-7 on my ballpark tour. Twelve down. Eighteen to go.